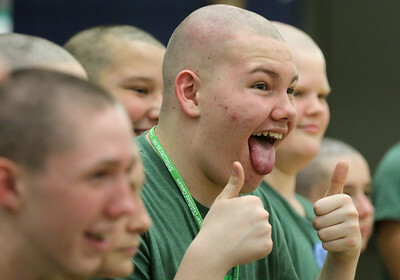 Matthew Apgar - mapgar@shawmedia.com Sebastian McClane gives the thumbs up sign as he poses for a group photo with other participants in the St. Baldrick's event at Richard Bernotas Middle School on Friday, March 23, 2018 in Crystal Lake. 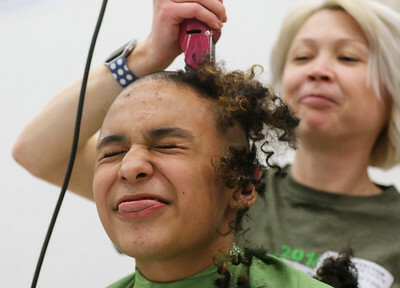 Participants raised more than $12,000 for the St. Baldrick's Foundation, which helps fund childhood cancer research. 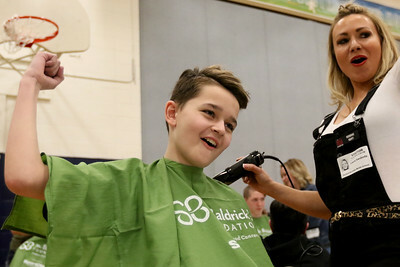 Matthew Apgar - mapgar@shawmedia.com Johnny McMinn reacts as Jennifer Orlick shaves off his hair during the St. Baldrick's event at Richard Bernotas Middle School on Friday, March 23, 2018 in Crystal Lake. Participants raised more than $12,000 for the St. Baldrick's Foundation, which helps fund childhood cancer research. 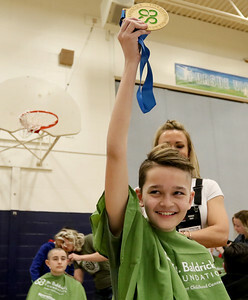 Matthew Apgar - mapgar@shawmedia.com Blake Bajak raises his St. Baldrick's medal high in the air after it was announced that he was the top donor, having raised $4,000 for the St. Baldrick's event at Richard Bernotas Middle School on Friday, March 23, 2018 in Crystal Lake. Participants raised more than $12,000 for the St. Baldrick's Foundation, which helps fund childhood cancer research. 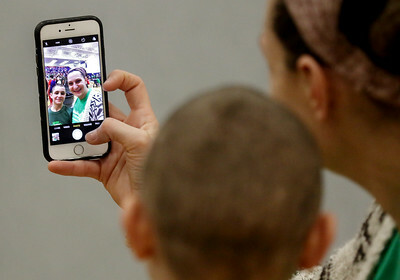 Matthew Apgar - mapgar@shawmedia.com Sashire Ayares takes a selfie with her son Aiden after having his head shaved for the St. Baldrick's event at Richard Bernotas Middle School on Friday, March 23, 2018 in Crystal Lake. Participants raised more than $12,000 for the St. Baldrick's Foundation, which helps fund childhood cancer research. 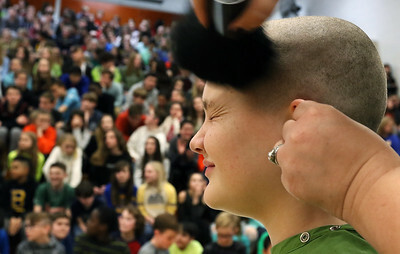 Matthew Apgar - mapgar@shawmedia.com Henry Zentner reacts as Stephanie Wise shaves his head during the St. Baldrick's event at Richard Bernotas Middle School on Friday, March 23, 2018 in Crystal Lake. Participants raised more than $12,000 for the St. Baldrick's Foundation, which helps fund childhood cancer research. 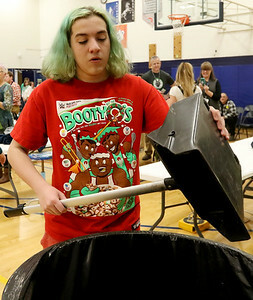 Matthew Apgar - mapgar@shawmedia.com Rachel Bratanick dusts off the loose hair from the face of Jake Eskridge as hundreds of students watch from the bleachers during the St. Baldrick's event at Richard Bernotas Middle School on Friday, March 23, 2018 in Crystal Lake. Participants raised more than $12,000 for the St. Baldrick's Foundation, which helps fund childhood cancer research. Matthew Apgar - mapgar@shawmedia.com Michael Barbaro cleans up the loose hair after the St. Baldrick's event at Richard Bernotas Middle School on Friday, March 23, 2018 in Crystal Lake. Participants raised more than $12,000 for the St. Baldrick's Foundation, which helps fund childhood cancer research. Matthew Apgar - mapgar@shawmedia.com Blake Bajak and stylist Laura Swoboda react wtih cheers after it was announced that Bajak was the top donor, having raised $4,000 for the St. Baldrick's event at Richard Bernotas Middle School on Friday, March 23, 2018 in Crystal Lake. Participants raised more than $12,000 for the St. Baldrick's Foundation, which helps fund childhood cancer research. 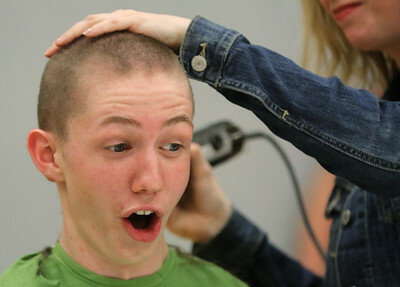 Johnny McMinn reacts as Jennifer Orlick shaves off his hair during the St. Baldrick's event at Richard Bernotas Middle School on Friday, March 23, 2018 in Crystal Lake. Participants raised more than $12,000 for the St. Baldrick's Foundation, which helps fund childhood cancer research.